Catching salmon on a fly rod is the most satisfying and exciting method you can use and there's nothing that beats the sound of a fly reel under strain from a lively 'powerhouse' of a fish. Here's a few pointers well worth bearing in mind when you receive your next 'tug' from the underworld! The key to being effective at catching salmon on the fly is that you don't react to the initial tug or nudges on the fly reel. This can be particularly hard to do if you've come from a trout fishing background and are fully trained to immediately lift the rod to set the hook. 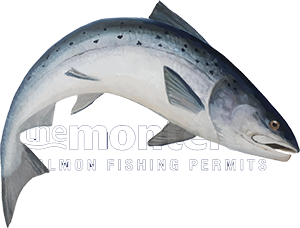 In 99% of cases salmon must be given enough time to turn on the fly and start consistently drawing line off the reel before the time is right to tighten on them to set the hook. The only 'rare' exceptions to this rule are when you're stripping a high speed fly or old resident salmon aren't taking the fly properly and only 'snapping' at the fly where tightening immediately is your only chance of hooking them. With 'normal' taking behaviour in mind it's crucial you have the composure to wait until you're at least several 'slow' seconds into the steady draw of line from the fly reel after the initial tugs have ceased before you attempt to set the hook. These seconds will feel like minutes but it's crucial you give the salmon plenty of time to turn and pull away. Wait for the steady line draw off your reel before simply clamping the face of the fly reel with the rod tip pointing down to briefly feel the weight of the fish which will tell you a successful hook hold has been achieved. This 'logical' hook point pressure procedure allows the salmon's bodyweight and forward momentum to squeeze the hook home properly when 'you put the brakes on' which then makes it very difficult for the fish to get rid of the fly. Logic should tell you that the above hooking method will be far more effective than the normal 'lift into the fish' approach which engages the soft action of the fly rod & lightly set reel clutch which 'logically' exerts little or no effective pressure on the hook point. This just 'lift into it' approach accounts for the loss of thousands of salmon hooking opportunities on the Scottish rivers every year. If you don't set the hook properly a salmon will usually always demonstrate how good it is at getting rid of any unwanted object from its mouth and normally only a few seconds after contact. Spare yourself that dreadful feeling of loss and daunting thoughts of what could have been and deploy the above rod tip down clamping method to ensure your water coverage skills and patience isn't wasted! Remember that when you put the brakes a salmon with the rod tip pointing down in the direction of the fish by momentarily clamping you fly reel face the only thing 'logically' between your hand and the hook point(s) is the 'negligible' core stretch of your fly line.